PavemetricsTM Laser Tunnel Scanning System (LTSS) uses multiple high-speed laser scanners to acquire both 2D images and high-resolution 3D profiles of tunnel linings. The LTSS is 100 times faster and 10 times more accurate than typical LIDAR technology; it can scan a 12m tunnel vault at 1-mm image resolution and 3D data at acquisition speeds of up to 20km/h. Larger surfaces can be captured through multiple passes (and the images and data “stitched”) or scanning width can be increased through the addition of sensors. Once digitized, the tunnel data can be viewed and analyzed offline by operators using multi-resolution 3D viewing and analysis software that allows for high-precision measurement of virtually any tunnel feature. Automatic analysis software is also available to detect and rate the condition of joints, faulting, cracks, and degraded concrete as well as points of water ingress in the tunnel lining. Our LTSS system can acquire 120,000,000 3D- and 2D-image points per second with a 0.5mm accuracy compared to typical LIDAR accuracies of 5.0mm for just a few 100,000 points. 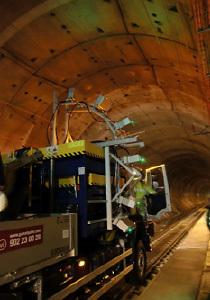 LTSS technology was used to scan high-speed-train rail tunnels such as the 28-km-long Spanish Guadarrama Tunnel in full 1-mm resolution (x,y,z) in just 3 hours. It has also been used to acquire data on the Tokyo Metro System in Japan. 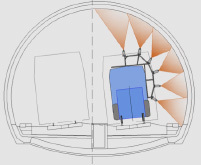 Vaults are scanned one half going forward and the second half coming back. The standard LTSS configuration (6 sensors) allows for the scanning of a full 12m of tunnel-surface perimeter in a single pass. Larger surfaces can be captured through multiple passes (and the images and data “stitched”) or scanning width can be increased through the addition of sensors. Automatic analysis software is available to detect and rate the condition of joints, faulting, cracks, and degraded concrete as well as wet-and-humid-area tunnel linings. Click on the movie below to see the capabilities of the LTSS.